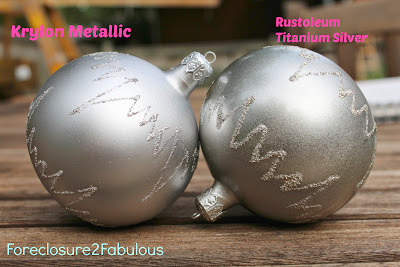 A ways back I typed into my BFF google "what is the best gold spray paint" and came across a great article on the blog Chris Loves Julia titled "Which Gold Spray Paint is Best?". 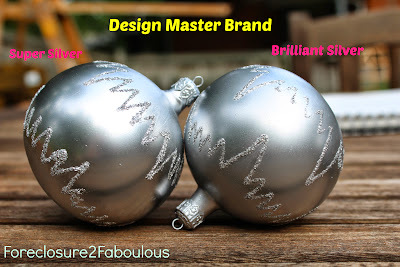 They do a great job with side-by-side comparison of different brands of spray paint and we ultimately went with their recommendation of Design Master and were AMAZED at how far metallic spray paint has come over the past 5-10 years. We've used it on a starburst clock my grandmother gave me and a globe Micheal picked up at a sale. Micheal had tried to paint a free lamp we picked up with "chrome" spray paint that he picked up from Home Depot and was horribly disappointed with the results. It didn't look remotely metallic. A second attempt with a different brand looked a little more like satin nickel and we stuck with that because, well, it was a free lamp from craigslist that we used for lighting construction areas. :) No need to go overboard. The finish is pretty corroded in some areas so it would be difficult to restore it back to it's original luster (which we would of course prefer) so spray paint is the next option. We are deciding between doing a silver/chrome finish or stay with the original look of gold. So we did our own experiment using some of the different silver options on the market to see which one looked best/most metallic. We chose to use some Christmas Ornaments that came in a box at an estate sale that I didn't love. Micheal set me up a nice little painting station. The Design Master Super Silver was the CLEAR winner in terms of reflectiveness and silver/chrome look. Brilliant Silver and Krylon Metallic were pretty close, but in my opinion the Brilliant Silver just barely edges it out. The Rustoleum was a dud, hard to work with, and looked very fake.